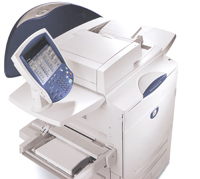 Get the great digital color and speed of our Xerox Docucolor 250. $.39 per copy off the glass! With an additional rip charge, same price per copy for digital prints from your file. OCR SCANNING - Yes! We can take your paper doucuments and convert them into fully editable MS Word documents for you! Our special pricing for a limited time is $5 setup + $.50 per page. NEW CUSTOMER DISCOUNT - Just for finding us on the web, a 15% discount on your first order for anything other than the above specials.